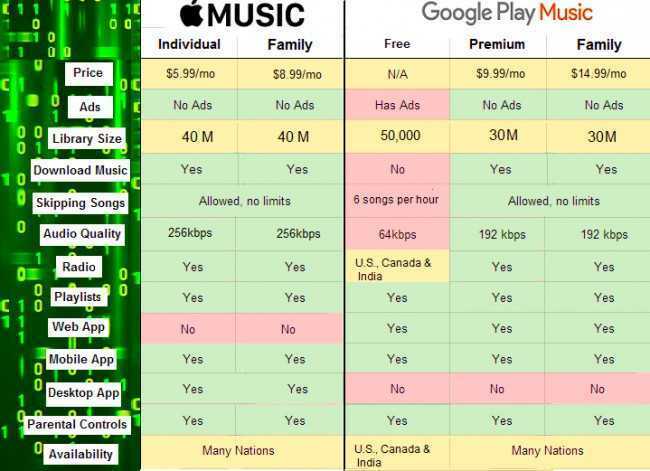 Apple Music vs Google Play, What's Your Pick? 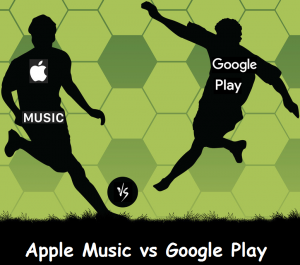 Online Music Store Apple Music vs Google Play, What’s Your Pick? Apple Music and Google Play Music services are the latest major streaming service in the streaming industry. Both services were launched in mid and late 2015 long after brands like Pandora and Spotify already had fan bases. But now, since Apple Music and Google Play Music were launched, the two streaming services had some time to settle in and they have become major forces in the streaming industry. We have decided to look at the services to see if they stand up to what they offer and how they compare to each other. Google Play Music is simple, all you need to do is sign in on a web browser or through the Google Play Music app. On the homepage, you will see a message asking you to personalize the services. Click on the message to identify your music genre and artist from an endless list of artists. Google offers paid and free versions of play music with a trial period of 30 to 60 days in case you want to subscribe to the paid version. Apple Music too has a page representing music genres and artists that you need to choose from while customizing your page. You need to click once on the genre or artist you love and twice on the one you like and X on the ones you don’t like. Their offer different options to choose from and once you are finished choosing, you are ready to rock and roll. The two music streaming services stream music at different bitrates. Google Play Music streams at 320kbps and Apple Music streams at 256kbps. However, Google Play Music streams MP3 whereas Apple Music streams AAC. Both sound qualities are great sometimes you won’t notice the difference. Google Play Music offers a thirty-day trial, after which you have $9.99 per month for the basic plan. But they don’t have the family or student plans. On the other hand, Apple Music (plans) has three tiers, the Basic, Family and Student plans. You need to pay a monthly fee of $9.99 for the basic plan and $14.99 for the family tier. If you are a student and you have proved, you need to pay $4.99 per month. Apple Music users are set to enjoy family and student plans, and the free tier level. They can gain access to services like a few ads-supported radio station, the beats 1 radio, viewing connect streams and finally accessing your personal iCloud Music Library. Google Play Music free tier includes listening to an ad-supported radio station, and skip up to six tracks per hour. They are quite a few stations available in the free tier including the new releases, to charts and stations based on activity and moods. Finally, you will get to listen to over 50,000 songs and upload your iTunes library quickly using an extension they provide. Apple Music is available for Mac, PC, Android and iOS whereas Google Play Music is available on Android devices iOS as well as the PC. The two services offer the same number of songs. They both offer 40 million tracks with a vast selection of music, but different playlists. Apple Music has an edge over Google Play Music because of it’s curated playlists. They have Apple Connect, a feature that allows users to receive curated music from the creator they follow. Apple has its radio station which features special appearances by major artists. Google Play Music has no features that allow users to discover new music. In contrast to Google Play Music, Apple is all about discovery. Both services are filled with recommendations based on the artist that they follow. Further, the Apple Music Connect feature allows the user to discover new music curated by both their favorite artists and apple themselves. Again, the debate on what you choose depends on personal preferences. When it comes to apps, Apple Music is being criticized for their design of the mobile app. But the app is not that different from the one on Google Play Music since both services use the same navigational methods though slightly different features. For instance, Google Play Music app design has guidelines that make it bright and flashy where as Apple Music opts for a more elegant approach. Again, you decide depending on your preferences. Before deciding the best music streaming services, you need to check the services yourself and try them. For instance, if you want access to everything that Google offers, including YouTube, then Google Play Music is the best for you. In contrast, if you wish to discover curated, new music, consider going for Apple Music. To be honest, there is a light difference between the services offered by both streaming services.